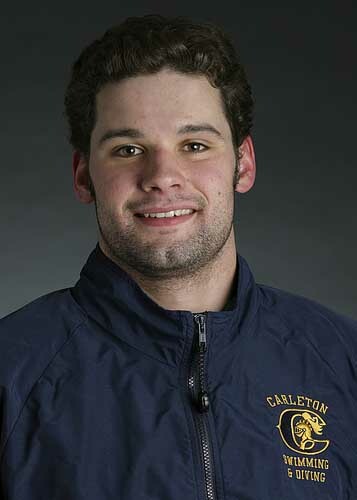 On September 3, 2006, Carleton student and varsity swim team captain Ted Mullin lost his battle with sarcoma, a rare form of cancer. Beloved by students and faculty alike, he was completely invested in college life. He exhibited a strength and love of learning that left an unforgettable impression on the Carleton community. Two months after Mullin’s death, the Carleton swim team decided to “leave it in the pool” in honor of his passing. On November 7, 2006, they participated in the first “Hour of Power,” an hour-long relay designed to raise awareness of sarcoma. Currently, the “Hour of Power” flourishes; in 2013-14, the event attracted more than 8,100 contributing athletes from across the country. And like nine years ago, it still occurs in the 25-yard pool in West Gymnasium. 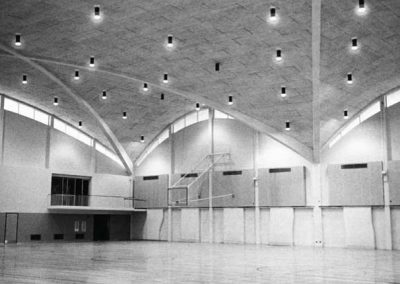 Since its construction in 1964, West Gym has served as the setting for numerous college athletic and academic events. 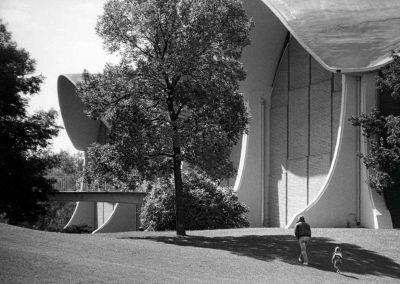 Designed by Minoru Yamasaki, one of the country’s most celebrated mid-century architects (and designer of the World Trade Center), it was initially part of President Laurence Gould’s ambitious plan to redesign campus. 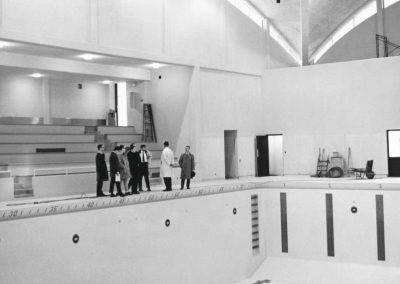 Costing $1.1 million, it was called the men’s gym; women had a separate facility-Cowling Gymnasium—also designed by Yamasaki. West Gymnasium remains heavily in use today. 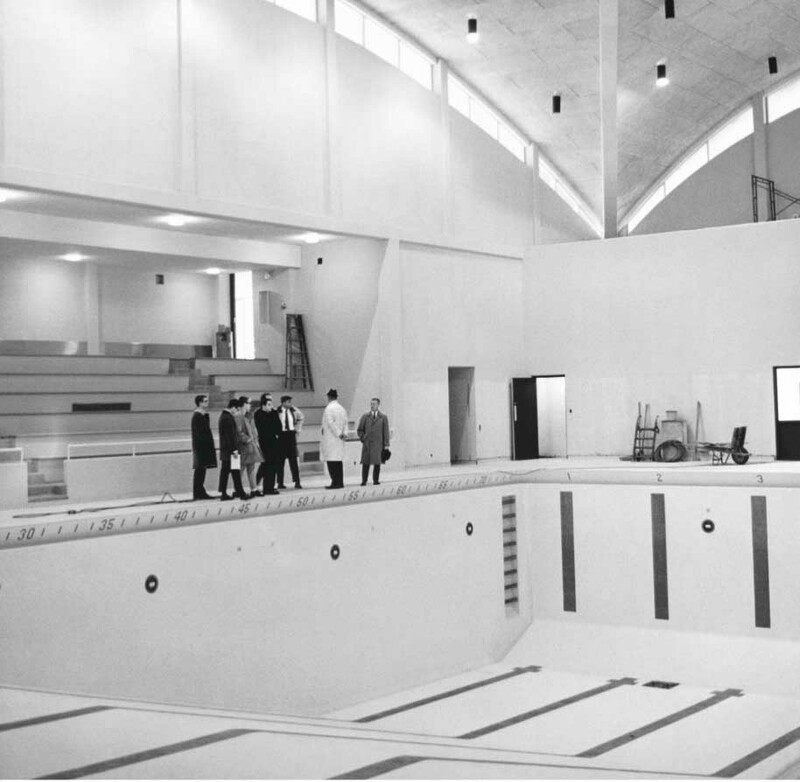 Intramural basketball games occur under the spacious ceilings, and Carleton’s swim team still holds practices and meets in the pool. And every November, Carleton swimmers exhaust themselves in honor and memory of Ted Mullin. 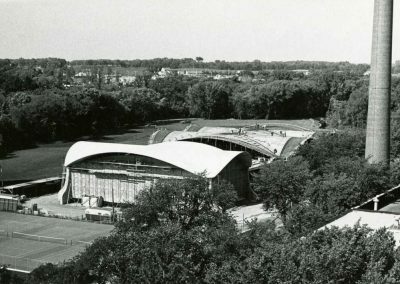 This picture was taken from the roof of Sayles Hill in 1963 when the gym was under construction. You see a similar view if you walk from Sayles Hill, down the hill, to the gymnasium. 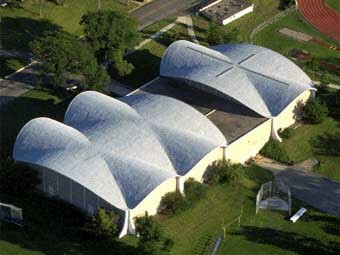 West Gym’s eye-catching roof extends past the building. Not only aesthetic, it serves to shade the band of windows directly underneath and limit the amount of sunlight passing through. 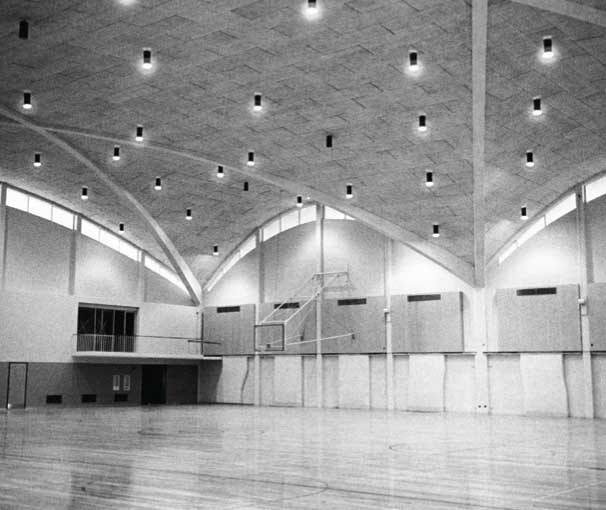 Rather than include large square windows to let in natural light, Yamasaki included a thin band of windows near the ceiling. This feature prevented excess light from blinding athletes in the midst of a meet or big game. When designing West Gymnasium, Yamasaki accounted for its elevation below central campus. 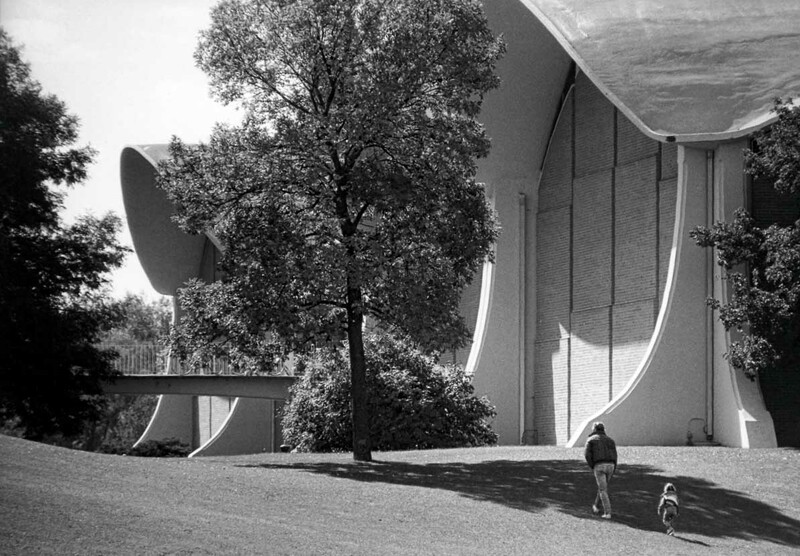 Because most viewers would be above the structure, Yamasaki purposefully included an interesting parabolic roof to arrest attention.